Flexible Hose Pipe Manufactuers & Suppliers in India – Flexible Hose Pipes, Rubber Hoses, Corrugated Metal Hoses, Metallic Hose Pipes, PTFE Hoses. We Offer Wholesale Prices for Flexible Hose Pipes! Metline is a specialised manufacturer of industrial flexible hose pipes braided with SS 304 and SS 316, and end connections as flanges or threaded type nuts, tc ferrule or pipes. Flexible hose pip#Stainless-Steel-Hose-Pipees are used to transfer air, steam and gases, and liquids, such as water, oils and chemicals. We also deal in PTFE lined flexible hose pipes, high pressure thermoplastic, Rubber hydraulic, Industrial & Composite hoses. We have extensive experience to manufacture all types of metallic and non metallic flexible hose assemblies for both high and low pressure applications. Our stainless steel flexible hose pipes are available with a wide range of end connections, bore sizes and lengths, which find applications in chemical industries, iron and steel manufacturing, oil and gas industry, paper and board manufacturing, and all process and liquid handling industries. 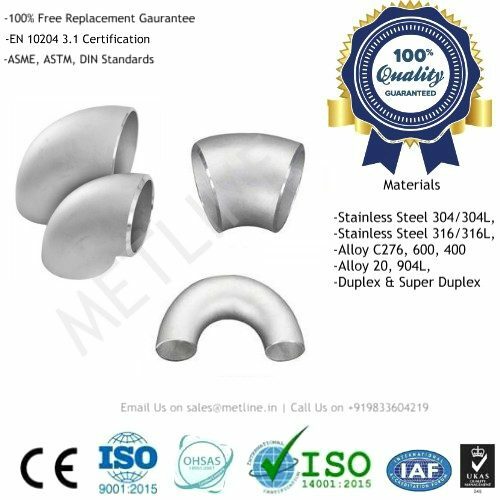 Metline Industries is an ISO 9001:2015 certified company, and can manufacture a large variety of stainless steel flexible hose pipes, with braid or without braiding in SS 304/304L, SS 316/316L or SS 321. All stainless steel flexible hose pipes manufactured by Metline, conform to BS 6501, Part 1:2004 / ISO 10380-2012. All our products are supplied with Test Certificates, as per EN 10204 3.1, with 100% Leak Proof Pressure Testing. We produce flexible hose pipes with various type of end fittings carbon steel, mild steel, stainless steel & brass for stainless steel annular corrugated metallic flexible hoses. The end connections are either TIG ( argon ) welded or brazed. Great service and quality. We received the hoses on time. Remain in touch for our new requirements. Thank you for your kind feedback. We look forward to serving you for all your current and future requirement for stainless steel hose pipes and other fittings.